Sitting next to one of Hollywood’s greatest film directors–Francis Ford Coppola–was a thrill for me. Both of us graduated from UCLA Theater and Film School. 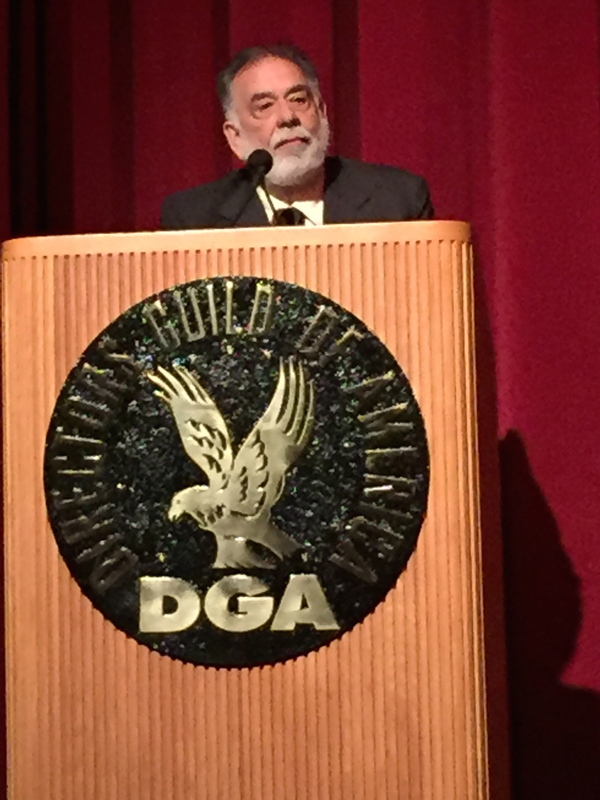 The night I met Coppola, he was receiving a special honor and award at the 25th annual UCLA TFT Film Festival Directors Spotlight along with a talented group of film students. Sitting in a large theater at the Director’s Guild of America on Sunset Blvd. in Hollywood, I watched UCLA Dean Teri Scwartz honor Francis Ford Coppola with the Distinguished Vanguard Director Award Presentation. She enlightened guests with the history of Coppola’s career and had her team put together a short compilation of Coppola’s films that included Apocalypse Now, Bram Stroker’s Dracula, The Cotton Club, Finian’s Rainbow, The Godfather, The Godfather Part II, The Godfather Part III, The Outsiders, Peggy Sue Got Married and You’re a Big Boy Now. While a graduate student at UCLA, Coppola won a Samuel Goldwyn Award for the best screenplay. After this honor he was hired to write scripts for Seven Arts. He became one of the “New Hollywood” created in the 1970s, due to his iconic movies that included Patton, The Godfather, The Great Gatsby and Apocalypse Now, all filmed in the 1970s. This era was a time of social upheaval in the United States with the Vietnam War, The Civil Rights Movement, fear of nuclear war, rock n’ roll and drugs. Coppola, George Lucas, Martin Scorsese, Woody Allen, Mike Nichols and John Cassavetes were among the young and talented filmmakers eager to tell stories. Coppola and George Lucas became friends before either became famous. Coppola helped science fiction friend Lucas with his film THX 1138. He also produced Lucas’s first blockbuster, American Graffiti, and the two collaborated on Apocalypse Now. As this humble man accepted his award, he thanked many people and shared some insight into his successful career. “Writing and acting is the hardest part of film making,” he said. Coppola was eager to have his photo taken with this year’s student TFT winners. Winning student directors included Marta Savina,who won Outstanding Drama, Outstanding Achievement in Editing and the Myrl Schreibman Award. Other winners included Gayatri Bajpai for Outstanding Comedy; Reed Van Dyk for Outstanding Achievement Directing the Actor and in Screenwriting; Soraya Selene, Outstanding Achievement in Cinematography; Athanasios Papastergiou for Sound Design and Tiffanie Hsu for Alumni Jury Honorable Mention. He graciously shook everyone’s hand and congratulated each winner. Coppola is one of only six people in Academy Award history to receive an Oscar as a producer, director and screenwriter. I look forward to watching his next blockbuster.